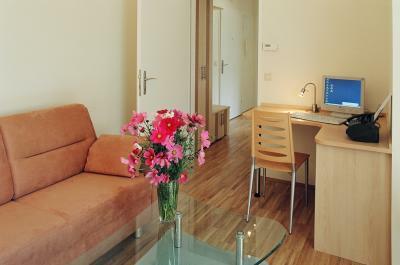 50 sq meters 4-star 1-beroom apartments in prime city location within Artist Quarter, at the beginning of the largest open market in Vienna, The Nashmarkt, and next to the Vienna's Central Subway Station Karlsplatz (300 meters) with the lines U1, U2, and U4. This apartment at the 6th floor (with elevator) offers you 2 separate rooms; one bed room with king sized double bed and one living room with high quality pull-out sofa beds for further 2 persons, hallway with wardrobe, bathroom with bathtub and shower, fully equiped kitchen. Further equipment are: Air condition, central heating, free high speed internet access with PC, direct line telephone, fax & ansewering system, stereo HIFI, DVD & CD-Player, safe, iron & board, hair drier, washer and drier etc.